First a shout out to all my lovely Bloggers who leave comments. I am totally overwhelmed by the comments I've had about LJJ and Sidekick Molly. Thank you all so much!!! 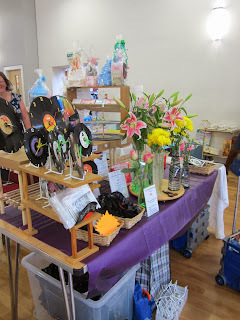 We have done our first craft fair in Colchester, Essex. I just took my LJJ items and some book cover collages. This is my stall. I kept it very simple and uncluttered. The lovely Laura and friend from 13 Stitches. Laura makes bears and her friend knits bears and other toys. 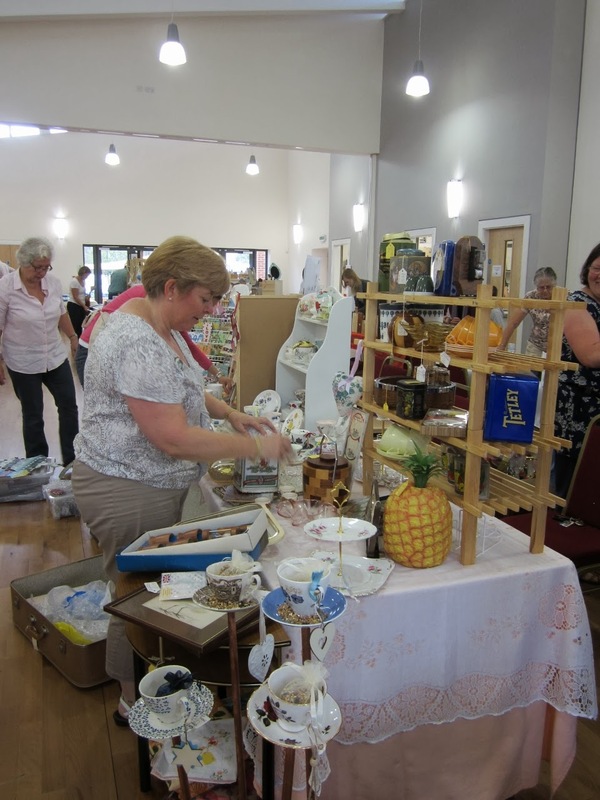 Sonia from Vintiquity setting up her scented candle tea sets, milk jugs and sugar bowls, cake stands and kitchenware. Vinyl as you have never seen it before, clock, bowls and so on. This lady sells at the Pop-up shop, in Chelmsford. So I had such a busy day, no time to take any more pictures. 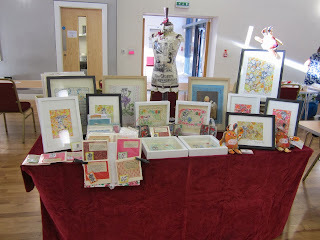 LJJ was voted a hit by the customers and several stallholders complimented me on my work too. 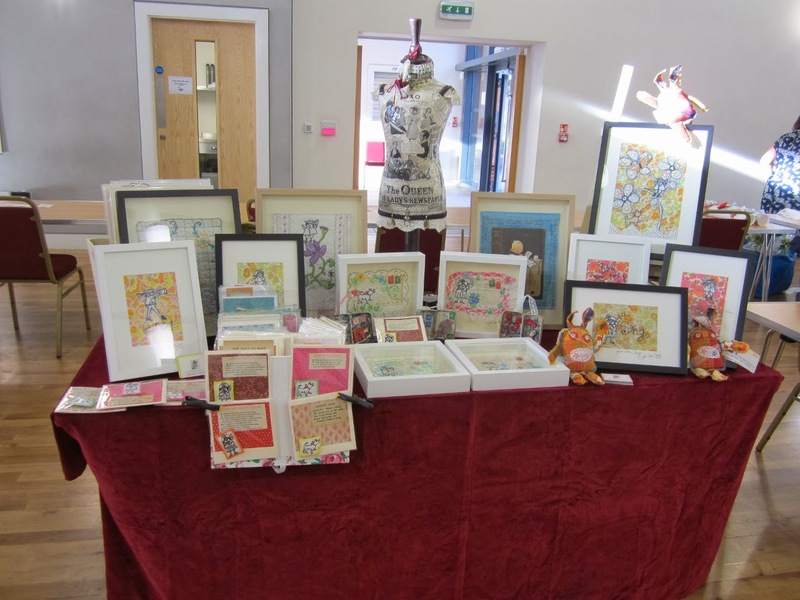 Plus I sold two pictures, several unframed works, brooches and cards. Also got booked for two more craft fairs. So feeling very pleased with myself. The fair was very well organised, super flyers posted to all the surrounding houses, food was plentiful and really reasonable. Signage was also good, the hall is only 18 months old and car parking was plentiful. a bonus the lighting was great as well. I've booked for the next one. Now I'm hoping to get in early on Handmade Monday, make yourselves a cuppa and have a peek at all the talented makers. Your stall does look nice, it looks a lovely venue. Glad that you sold as well not suprised really you have wonderful work. 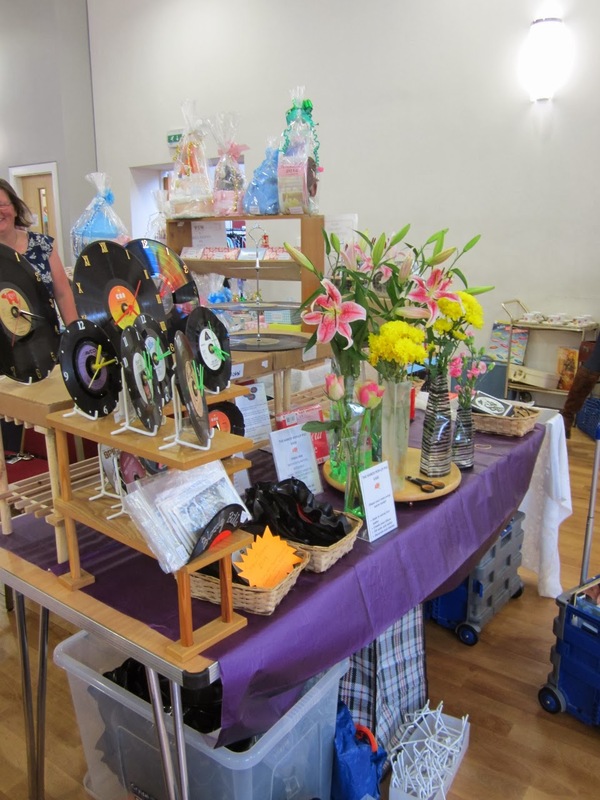 Your stall looks lovely and I'm glad to hear you had so many positive comments. Well done -glad it all went well. Good luck for the next fairs! Glad you had a good fair! Well done. It looks like a lovely fair, and your table looks great. Your fair looks lovely and not surpising Joan was a hit - she is great. Hope you have a good week. Your stall looks great, am glad you had a good time. It's always nice to share conversations with other crafters and with people who want to talk about your work too. FAbulous stall I'm glad you had a good day. I spotted a pineapple ice-cube pot - we used to have one of those - happy memories. How lovely that you had such a great day. So much work goes into these days and it is lovely that you came away with so much positivity. It's really good to hear of a well run fair, I'm glad you enjoyed it. 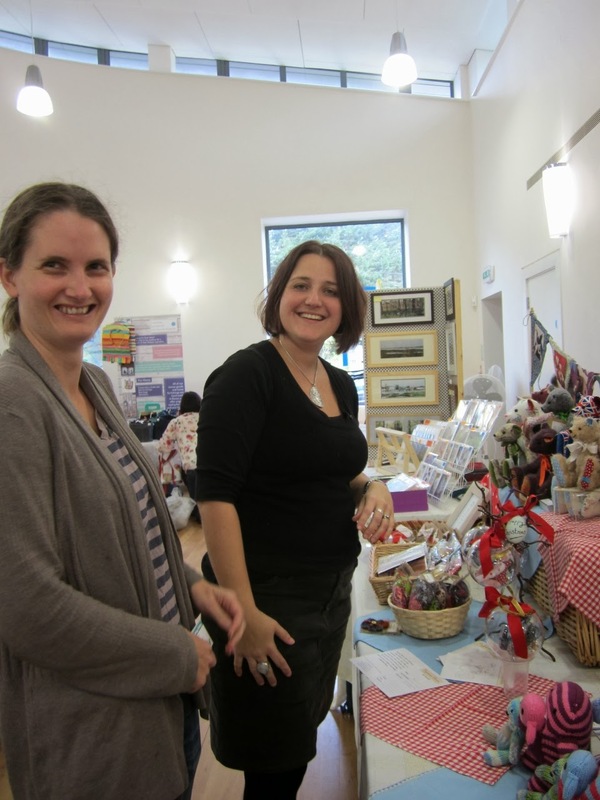 Your stall with all your creations looks lovely. I'm happy you had a good time. glad to hear it went well, your booth looks great.